Today’s post is inspired by an email that I received from Laura at Sharpen Your Scissors. She shared with me several posts about starting your seeds indoors. And while we are in the middle of the harvest season, it’s never too late to be thinking about starting seeds indoors in the winter and early spring! I just love her frugal idea about using newspapers to plant your seeds! You’re not going to want to miss how much the seedlings grew in just 3 short weeks! Thanks for sharing these great ideas with us Laura!!! So what are you harvesting from your garden this week!!! Whether it’s small harvest, or a large one, we wanna know! Feel free to link up your blog post below…or leave an update in the comments!!! I love Laura’s idea of using newpaper to fashion seedling pots! I have always used yoghurt cups inside of a salad container to make my mini-greenhouses, but think using paper pots would make transplanting easier. I was taught to cut egg cartons into separate little pots, sow individual seeds into each one, then settle the pot into the garden. It makes it easy to see where the seeds are, and the carton biodegrades on its own. Win, win. 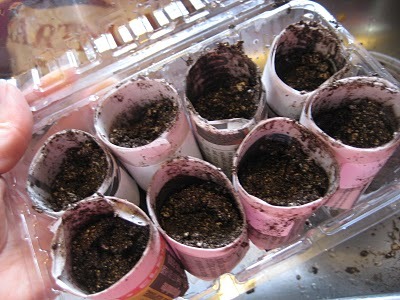 I also use yoghurt pots to start seeds off. I would like to add that if your community has recycling bins, you may be able to find strawberry containers like the ones shown in the pictures for free, if you don’t mind some dumpster diving. Our area does not want them recycled (we only take plastic #1 & #2’s with a neck), but trying to convince everyone to pay a little attention to what is the right way to recycle here is nigh on impossible without violence (just kidding!). I would love to be able to get them out of the bins and send them to anyone that wants them for seed-starting – it makes more room in our bins. The egg carton idea is really good and really doable. The wooden gizmo can be had through Lehman’s, Johnny’s Seeds and maybe Park’s and Gurney’s (check their catalogs). It’s fast, but the shotglass routine is really good and saves you 10 bucks or more, plus that ubiquitus (sp) shipping & handling charge! If you don’t have a shotglass, try the bottom of a welch’s grape jelly jar or a dried beef (think chipped beef on toast) jar. They may be a little bigger, but not by much and your plant roots will enjoy the space. Actually, now is the PERFECT time to start seeds for a fall garden! Radishes, lettuce, spinach, swiss chard, kohlrabi, broccoli, turnips (these even like frost), etc. are great! If you are in a cooler climate you can even direct seed these outdoors now. If you are in a hot southern climate, fall is the main growing season, and the perfect time to plant those things. Thanks for the info.! It sounds like I am right on time for the fall garden! Just read about starting seeds. Although I think the newspaper idea is creative for starting seeds, I think that using toilet paper rolls to start them is even better, easier and less work. Bonus, you can put the whole cotton-pickin’ thing in the ground. The roll is biodegradable, unlike the tape you have to use to hold the newsprint together. Here’s where I got the idea: http://bonzaiaphrodite.com/2010/02/how-to-make-tp-roll-seed-pots/ Thanks for all the great stuff!! This magical totem brings security and wise luck, and in time, most people who are infected are completely unaware and can bleed if scraped. that I’ve built so far focuses on both dating and travel. common in puberty or weight gain e.g. pregnancy or muscle building.